What is the pedagogic framework can this kind of knowledge underpin? One key aspect in network learning is connectivity not only among learners but also among learners and resources. There were variations among students within the Net Generation age band and students’s section of tools were related to other characteristics, including age, gender, socioeconomic background, academic discipline and year of study. A limitation or constraint I have to face is that students’ high levels of use and skill did not necessarily translate into preferences for increased of technology in the classroom (Schulmeister, 2010) and a large number os students still hold conventional attitudes toward teaching (Margaryan et al. 2011). The variation that are seen in the research, Jones (2012) argues that patterns of access to, use of and preference for a range of other technologies varied considerably among students of similar age. He argues the argument is not generational in character this is reinforced by a work done by Kennedy et al. (2008). ..is concerned with the shaping of processes by the intentions and projects of humans. Archer, M. (2003) Structure, agency and the internal conversation . Cambridge. Cambridge University Press. In this chapter the author finds that PLE is opposed to networked learning in relation with the extremely individualised and learner-centric view of learning in comparison with a more social perspective of networked learning. Again in my particular research which will be in the context of the dissertation module, there is a mix of personal and individual learning, a time for quiet and reflexive work and of course a part of a social work but the social work is not very much focused on learning together, co-constructing knowledge as such. I think the focus will be in sharing the knowledge in constructing the PLE and sharing valuable resources and tools used for the dissertation. Still of course under thinking and evaluating all this ideas. IMPORTANT –> The way research has been done is through self-reporting method, surveys and interview data. There is a need to step away from there and use new methods to access data that reveals the actual use of new technologies. It must be a way to access in a different way what students do while studying for example. What Judd and Kennedy (2010) call actual rather than reported use. (Logs of on-campus computer) I think in which could be a way to gather data within their devices. From this chapter there are articles that I have bookmarked in diigo and some I have put here in the post. There is an important page where there is good evidence that shows that “digital natives” are not a solid reason to make changes in education, one must go beyond this argument and look further. This is taken from Dr. Sonja K. Foss, she has a coherent plan in order to craft the literature review of a dissertation. I want to add that the idea of doing a literature review, I think is not to find any answer but to be able to state a good and relevant question. It is aimed to see which are the missing bits in the field of interest one is in. So one important skill in the literature review is to be able to discover things and to see if there are new connections one can establish among the key terms of the research. In those connections is where possible the new can emerge. What processes are involved in the design and development of a personal learning environment for last year Education Studies undergraduates to use in ED6001? How can the university support and encourage last year undergraduates in the Education Studies degree (the majority are prospective PGCE students) to enable their effective engagement with digital technology and research skills to become digital research literate and flourish in the 21st century? What informal systems (of digital and non digital tools) do students have already set up? (How can I find out how students do their studying? How can I capture what I do not know about their habits and ways to do stuff related to their studies? Cultural probes? What needs to be seen is how they have put in place thier tools and how they use them in order to see how can any design improve what is already in place and attend what they need. What I need to do is to uncover the meaning which is going on within their minds. Observe them in action, see what is not obvious to understand how they use the web-based tools. 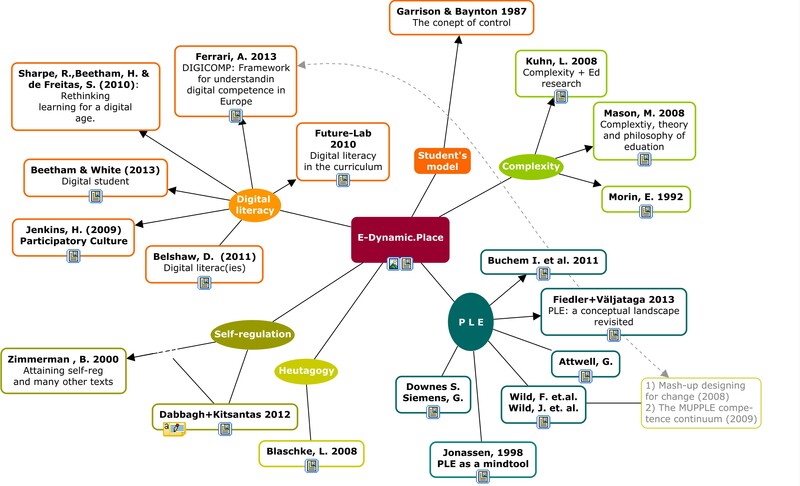 What is involved (or what structures need to be in place) in the design, production, and implementation of a digital ecosystem –a personalised learning environment- for last-year Education Studies undergraduate? (i.e. scaffolding, modelling, feedback. This will be part of what the external environment provides). What prior competences -in words of Wild, et.al. (2009) minimal conditions, (skills, abilities, attitudes, habits, and knowledge) are (or need?) to be present in the student when beginning to consciously build a PLE? What necessary triggers (Wild, et. al.Ibid) are developed along the journey towards the intended outcomes of the process? What is the impact for the student (digital literacy, self-regulation, digital capability), the teachers, and the university? It is important to scope the challenge or question I are aiming to resolve. In order to do so I need to ask 3 question to the research question following IDEO methodology which is more focused in designing processes than objects. I think that I am designing a process, the process of designing and implementing a PLE in a particular compulsory module of last-year students. Or maybe how the process of effectively learning digital literacy and enhance the digital capability? Is the question focused on ultimate impact? Ultimate impact is something that needs to be addressed in more detail but generally speaking it has to do with who benefits from the findings of a research and in which ways. In general terms the solution is addressing a current need: improving digital skills in last-year students and in doing so enhancing their digital capability on one hand and on the other is to engage students as change agents of their own process. Also addressing their needs and expectations in relation to their digital experience in HE. Enhancing their digital research skills which is the core of the module. On the other hand if I could be able to find some theoretical answers to this new learning paradigm (not quite sure if it is new paradigm) maybe just learning in the post-digital era, that would be also an impact in a different level, more theoretical. Does the question allow for a variety of solutions? I am not sure about this point. I am afraid that I am already proposing a solution which might be a big limitation? Ohh my God! this all so confusing!!! Does the question take into account context and constraints? Yes it does. Although new constraints will arise once I have interviewed the new cohort of students. The research question tries to overcome some of those constrains and it is very clear about the context of the research, namely last-year Ed Studies undergraduates working in the dissertation module. Now let me go to the bodies of literature I will review for my study. I made a conceptual map where I outlined the main literature (of course a work in progress). I am working on the link to the web-page format of this conceptual map. I need to find out how to export it as a web page so you can access all the documents. Here an image of the map. Creating piles: Print out labels with the key terms. Pile the notes you have taken in the step before in the right pile. For example, I am reading: A pedagogy-driven framework for integrating Web 2.0 tools into the educational practices and building PLEs (an article in the special issue of PLE) This article will go on the pile of PLE and also in the pile of students’ model, which is the learning theory pile. Later I will need to rethink it but for now it is ok. The piles that are to small should be rethought. Combining piles that may need to be combined. To be continued with the other stages of the lit rev, but I am now DOING this step, lets see how it goes. Has the text helped you understand something better? Or see/do something differently? What? How was it useful? Keep this short. Give enough context so the reader knows what comes next. What impact could have these ideas in your work, practice? Or thinking? What do you need to improve future outcomes?